Feeling Lucky? All items are 100% Authentic or money back guaranteed! 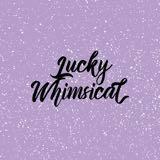 ONGOING AUCTIONS🤩 Instagram: @luckywhimsical All items are BRAND NEW. Shipment eta is about 8-10 weeks.